When I go to a meeting I am equipped with blank paper sheets and some colour markers. And I often use them. I start doodling. When I explain a situation, circumstance or a connection it is often just easier to draw. Interestingly most people join in after a while. They point to the drawing, bring in additional elements, add missing connections or question links. Some grab a pen and start doodling themselves. For me the highlight is when they join in drawing on my sheet. They add lines, boxes and circles. They add their thoughts and ideas, our joint drafting gets richer and more meaningful. At the end of the meeting I hand over the drawing. What I get in return is a big smile. 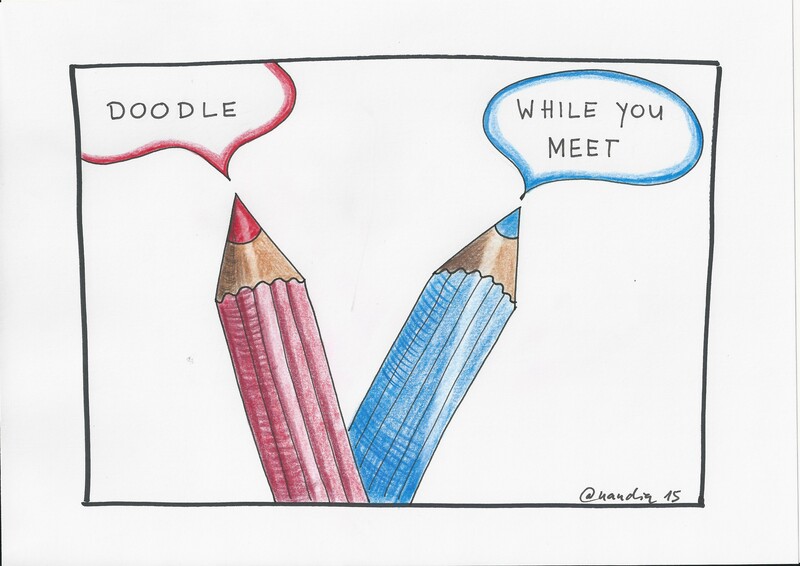 Doodling is more than mindless drawing. Why we need more visuals – what do you think? Dave Grey and his introduction “What is Visual Thinking?” makes everybody draw. Start with the squiggle birds. This is real fun. An amazing treasure of resources shared by Nancy White: Visual Work and Thinking. More planned and more strategic sketching with Martin J. Eppler and Roland Pfister: Sketching at Work. Thank you! Great drawing & doodling techniques by David Grey.